Download "In Debt? 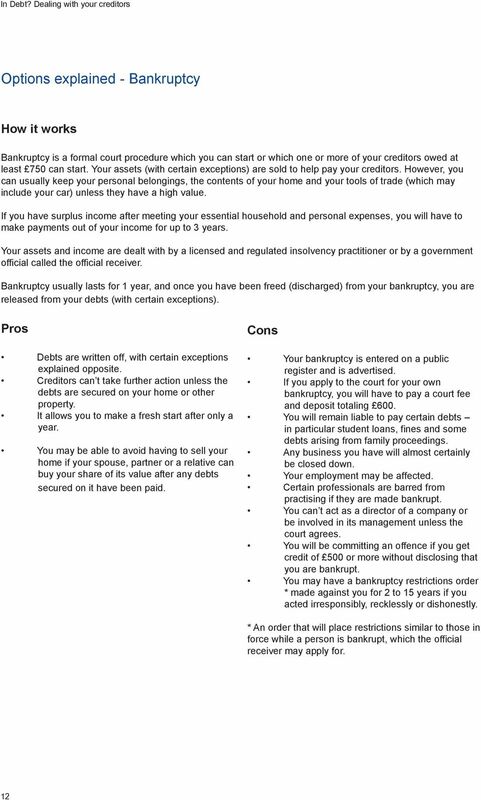 Dealing with your Creditors"
1 In Debt? 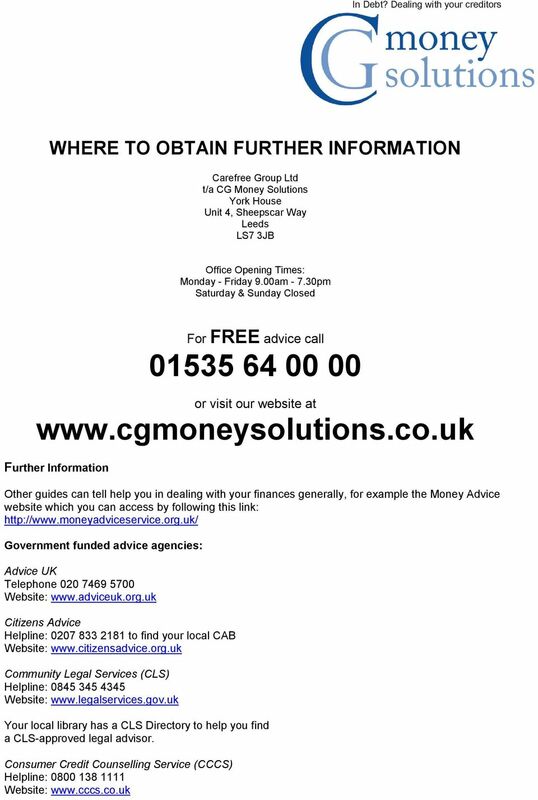 Dealing with your Creditors for FREE advice call This guide has been produced by the Insolvency Service with the help and support of the IVA Standing Committee. The Insolvency Service would like to thank the members of the IVA Standing Committee for their valuable input. 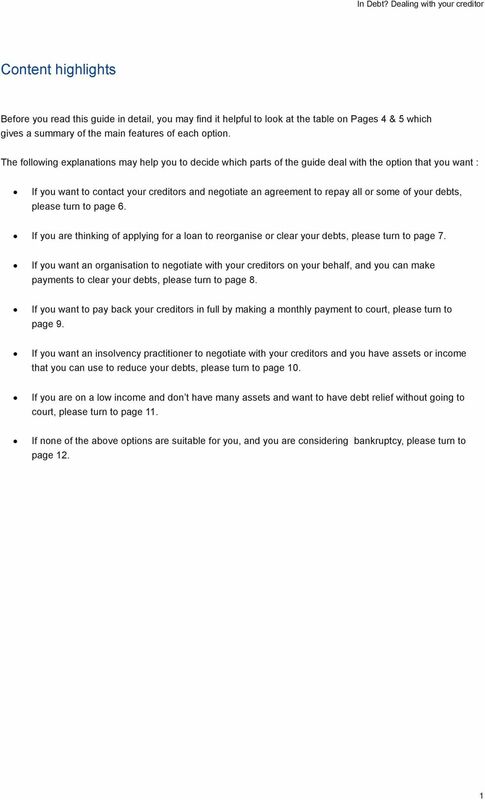 7 Options explained - Negotiated agreement with creditors How it works You contact your creditors and negotiate an agreement to repay all or some of the debts. Negotiated agreements may involve either or both of these: (1) payments from your income (2) payments from lump sums you receive, for example from an inheritance or from relatives. Your creditors may be prepared, at the start or later, to agree to write off part of what you owe them. If they do so, they should confirm this agreement in writing. (1) Payments from income: you need to work out how much you can afford to repay, after allowing for your essential household and personal spending such as mortgage or rent, heating, utilities, and housekeeping. You should offer to share any extra income among all your creditors, based on the amounts you owe them. This means that all your creditors are offered their share of what you can afford. You should also ask your creditors to freeze any interest or charges. Your creditors will expect you to give them regular updates of your income and expenditure so that they can see whether you can increase your payments. (2) Payments from lump sums: you may make payments towards your debts from a lump sum you receive and which your creditors may agree to accept in settlement of what you owe that is, they agree to write off the balance they are owed. However, if you do have extra income after paying your everyday expenses, they may expect you to make at least some payments from that as well. If you can t make payments temporarily, for example because of a short-term illness, creditors may agree to accept no payments or token payments of say 1 a month, but only for a limited period. 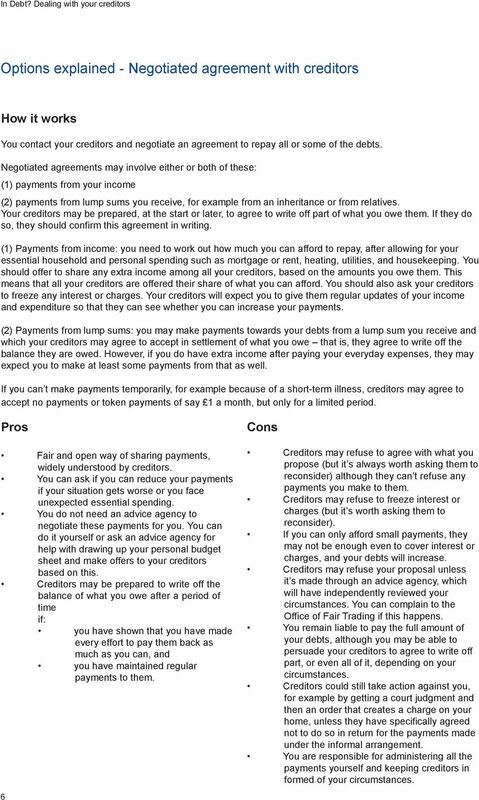 Pros Fair and open way of sharing payments, widely understood by creditors. You can ask if you can reduce your payments if your situation gets worse or you face unexpected essential spending. You do not need an advice agency to negotiate these payments for you. 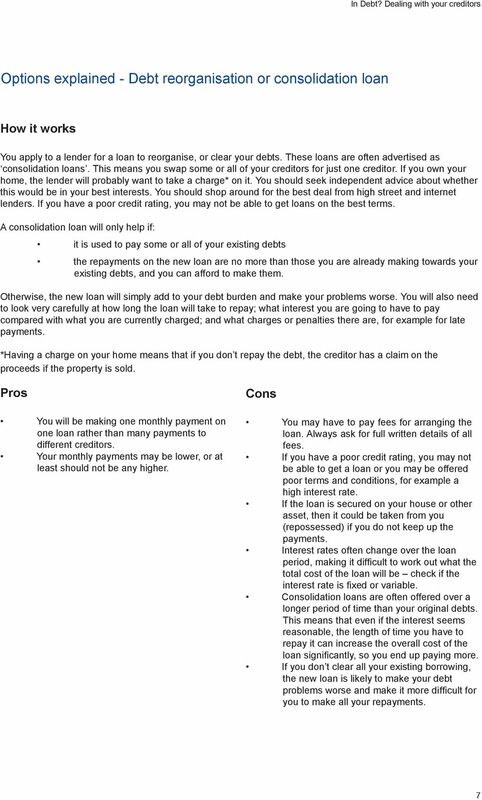 You can do it yourself or ask an advice agency for help with drawing up your personal budget sheet and make offers to your creditors based on this. Creditors may be prepared to write off the balance of what you owe after a period of time if: you have shown that you have made every effort to pay them back as much as you can, and you have maintained regular payments to them. 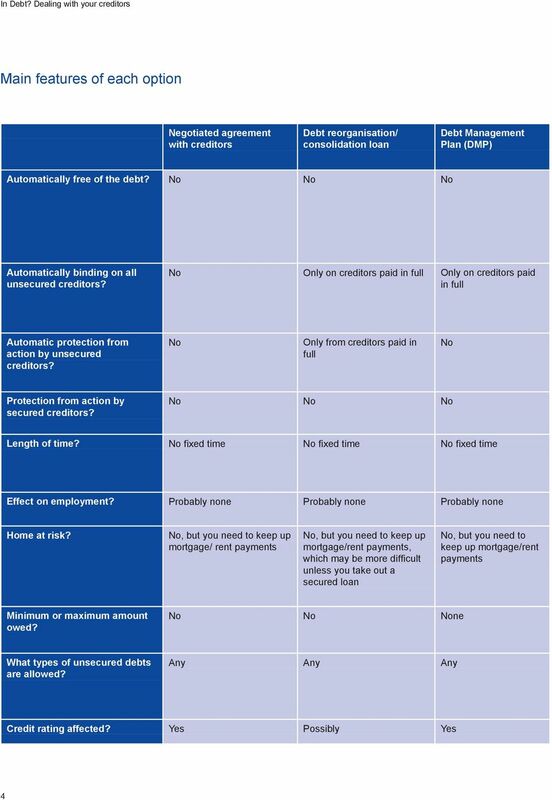 6 Cons Creditors may refuse to agree with what you propose (but it s always worth asking them to reconsider) although they can t refuse any payments you make to them. 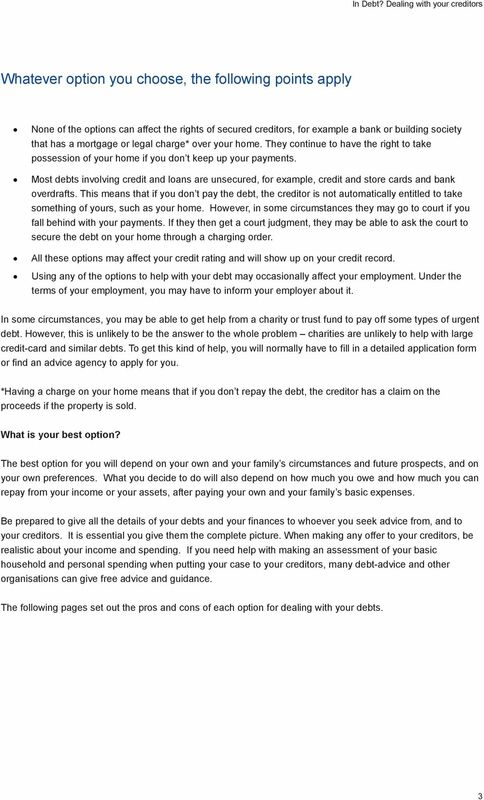 Creditors may refuse to freeze interest or charges (but it s worth asking them to reconsider). If you can only afford small payments, they may not be enough even to cover interest or charges, and your debts will increase. Creditors may refuse your proposal unless it s made through an advice agency, which will have independently reviewed your circumstances. You can complain to the Office of Fair Trading if this happens. 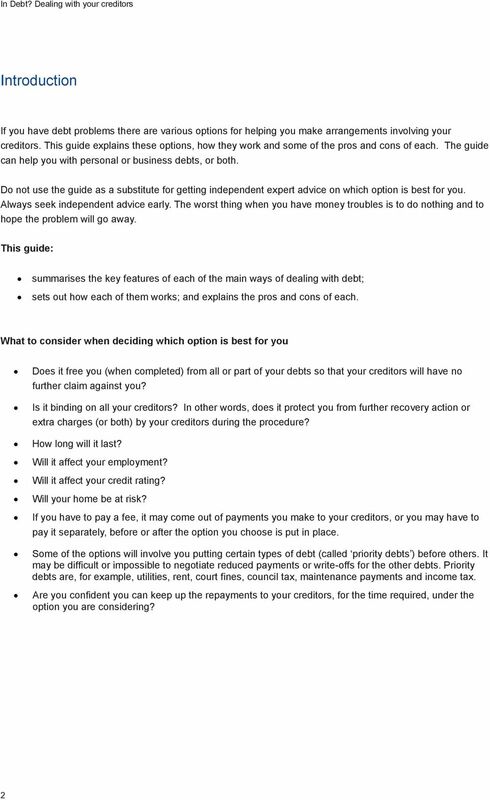 You remain liable to pay the full amount of your debts, although you may be able to persuade your creditors to agree to write off part, or even all of it, depending on your circumstances. Creditors could still take action against you, for example by getting a court judgment and then an order that creates a charge on your home, unless they have specifically agreed not to do so in return for the payments made under the informal arrangement. You are responsible for administering all the payments yourself and keeping creditors in formed of your circumstances. 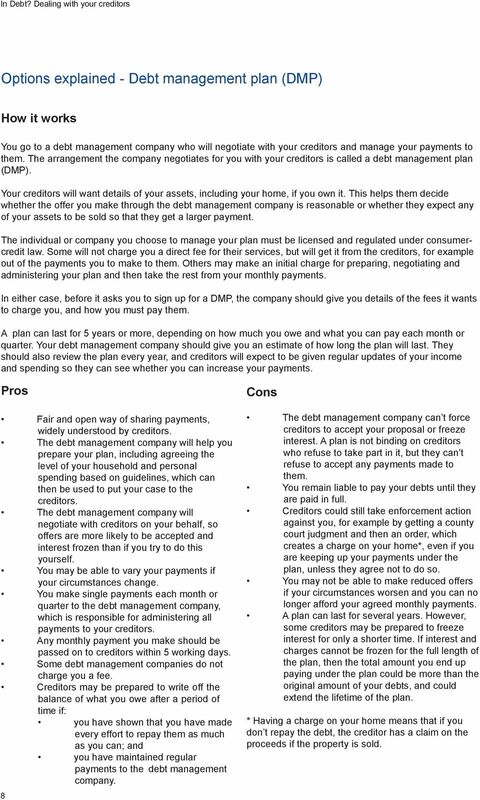 9 Options explained - Debt management plan (DMP) How it works You go to a debt management company who will negotiate with your creditors and manage your payments to them. The arrangement the company negotiates for you with your creditors is called a debt management plan (DMP). Your creditors will want details of your assets, including your home, if you own it. This helps them decide whether the offer you make through the debt management company is reasonable or whether they expect any of your assets to be sold so that they get a larger payment. The individual or company you choose to manage your plan must be licensed and regulated under consumercredit law. Some will not charge you a direct fee for their services, but will get it from the creditors, for example out of the payments you to make to them. Others may make an initial charge for preparing, negotiating and administering your plan and then take the rest from your monthly payments. In either case, before it asks you to sign up for a DMP, the company should give you details of the fees it wants to charge you, and how you must pay them. A plan can last for 5 years or more, depending on how much you owe and what you can pay each month or quarter. Your debt management company should give you an estimate of how long the plan will last. They should also review the plan every year, and creditors will expect to be given regular updates of your income and spending so they can see whether you can increase your payments. Pros Fair and open way of sharing payments, widely understood by creditors. The debt management company will help you prepare your plan, including agreeing the level of your household and personal spending based on guidelines, which can then be used to put your case to the creditors. The debt management company will negotiate with creditors on your behalf, so offers are more likely to be accepted and interest frozen than if you try to do this yourself. 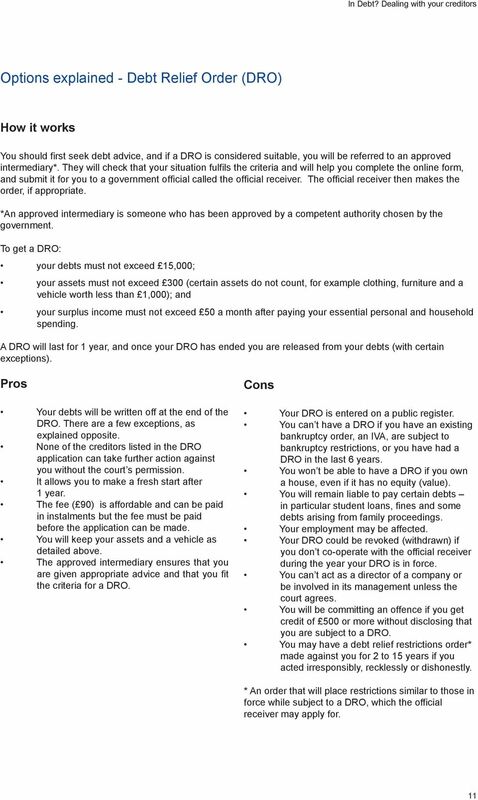 You may be able to vary your payments if your circumstances change. You make single payments each month or quarter to the debt management company, which is responsible for administering all payments to your creditors. 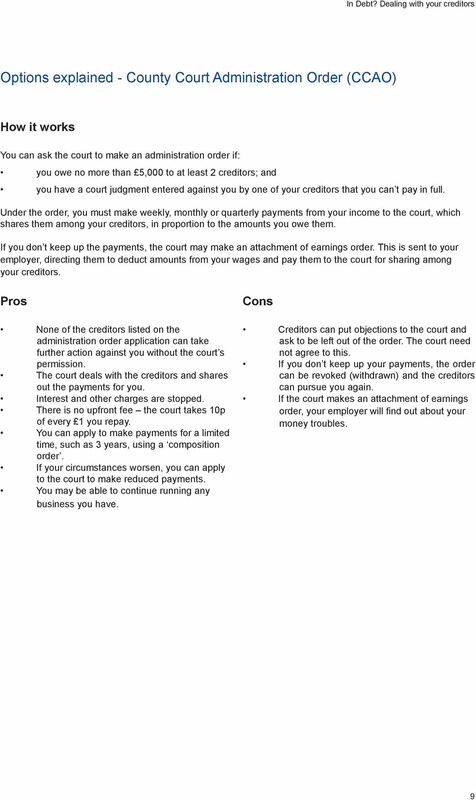 Any monthly payment you make should be passed on to creditors within 5 working days. 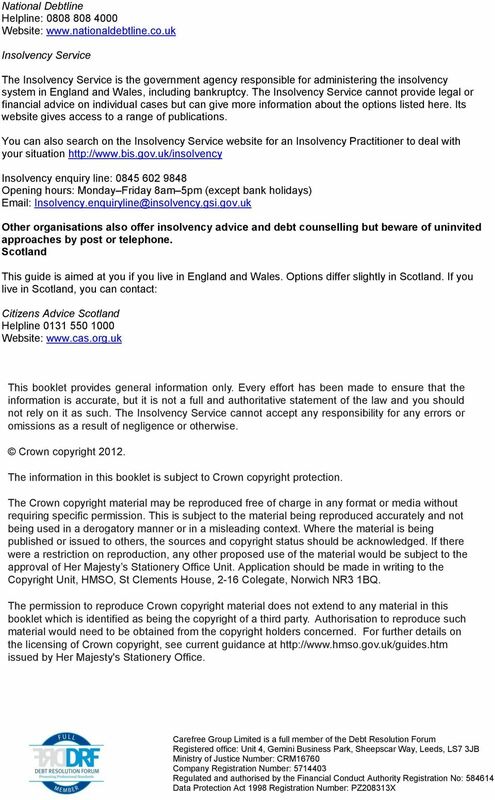 Some debt management companies do not charge you a fee. Creditors may be prepared to write off the balance of what you owe after a period of time if: you have shown that you have made every effort to repay them as much as you can; and you have maintained regular payments to the debt management company. 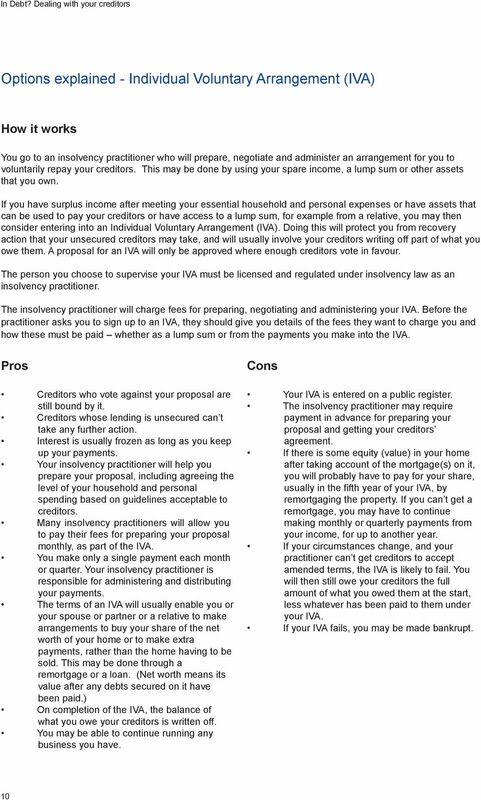 8 Cons The debt management company can t force creditors to accept your proposal or freeze interest. A plan is not binding on creditors who refuse to take part in it, but they can t refuse to accept any payments made to them. You remain liable to pay your debts until they are paid in full. 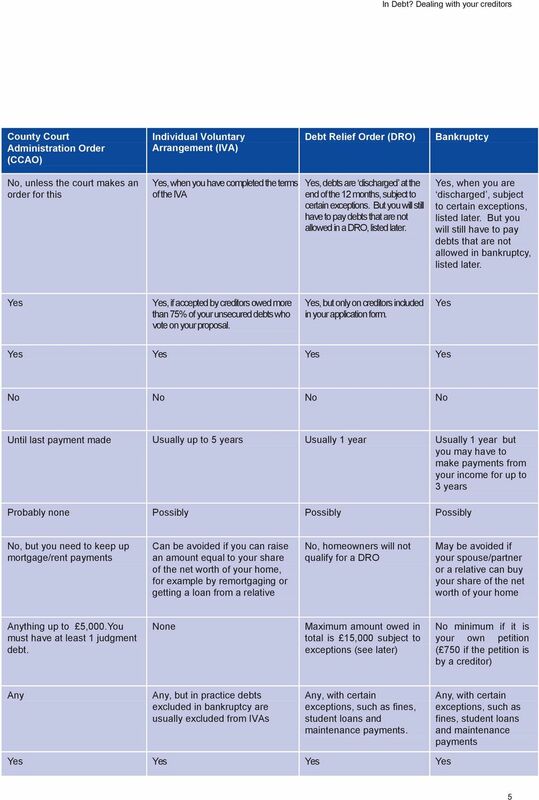 Creditors could still take enforcement action against you, for example by getting a county court judgment and then an order, which creates a charge on your home*, even if you are keeping up your payments under the plan, unless they agree not to do so. You may not be able to make reduced offers if your circumstances worsen and you can no longer afford your agreed monthly payments. A plan can last for several years. However, some creditors may be prepared to freeze interest for only a shorter time. If interest and charges cannot be frozen for the full length of the plan, then the total amount you end up paying under the plan could be more than the original amount of your debts, and could extend the lifetime of the plan. * Having a charge on your home means that if you don t repay the debt, the creditor has a claim on the proceeds if the property is sold. What options are available? Ways to deal with debt. We have over 20 years experience of helping people just like you. 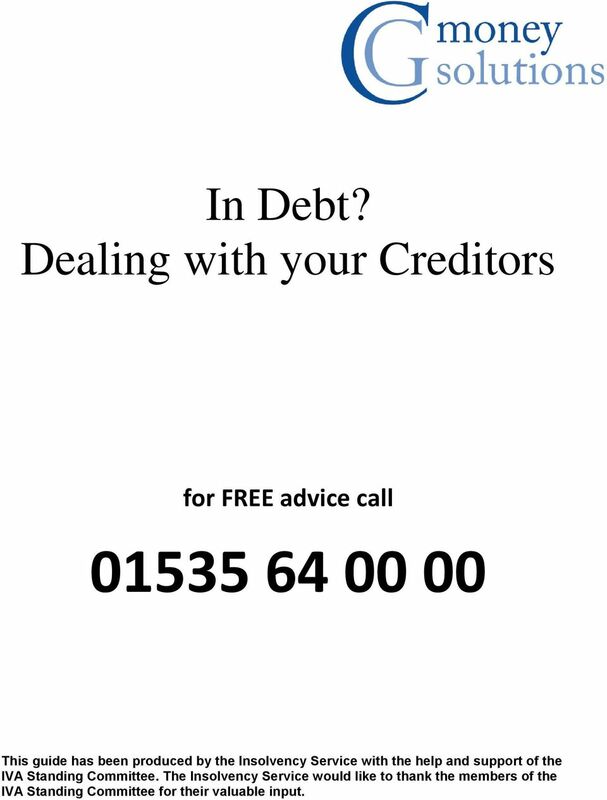 We are the only small business debt advice charity operating in the UK. Australia. Bankruptcy or Debt Agreement?